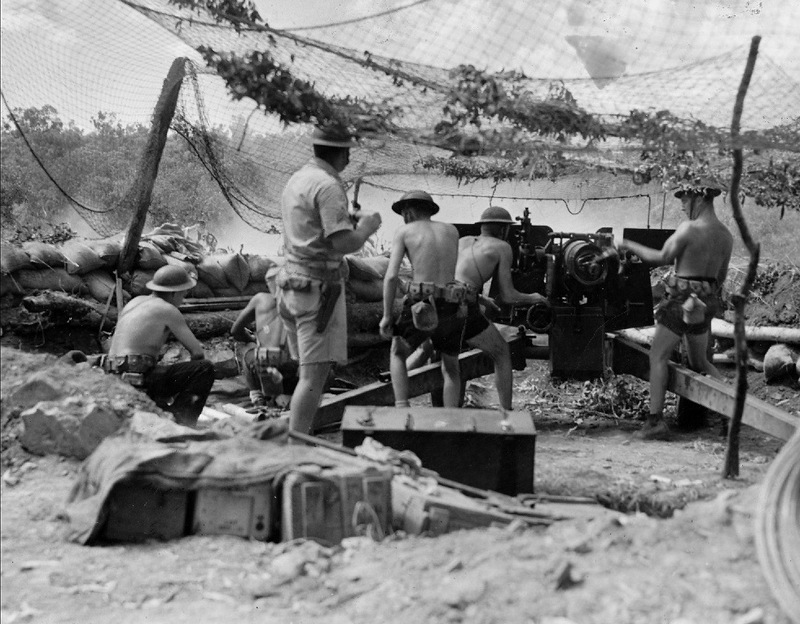 This page aims at presenting and examining the uniforms and equipment of the US 147th Field Artillery Battalion (National Guard) that were stationed in the Northern Territory in first half of 1942. This task itself is one of difficulty however as there is relatively little photographic evidence from which to base a primary study, and those that do exist are subject to copy write. With this in mind, photos of other US Field Artillery (National Guard) units in 1940-41 will be used to form the basis of this study. 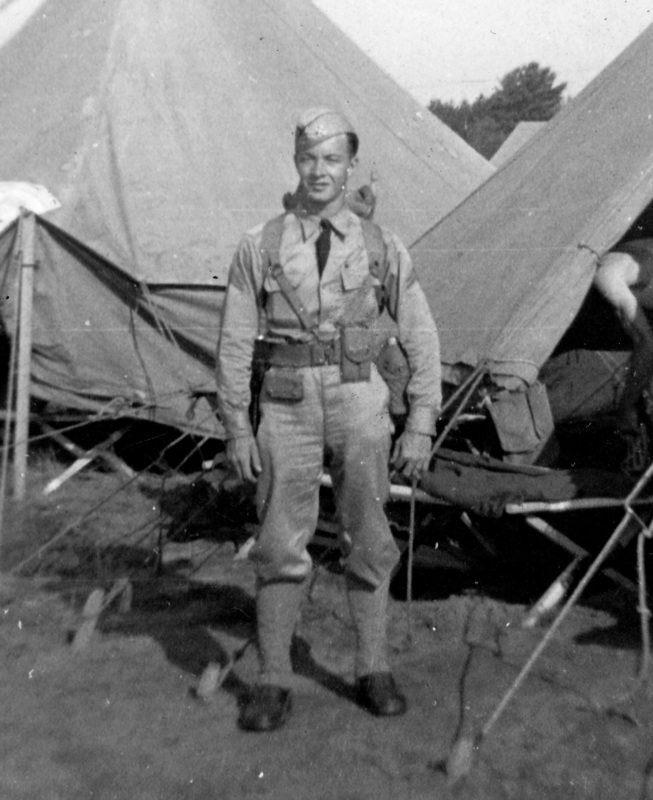 Hence a majority of the photos that appear bellow are of the US 140th Field Artillery Battalion (National Guard) in 1940 and 1941. It is hoped that other pictures will be provided by contributors in the coming years. 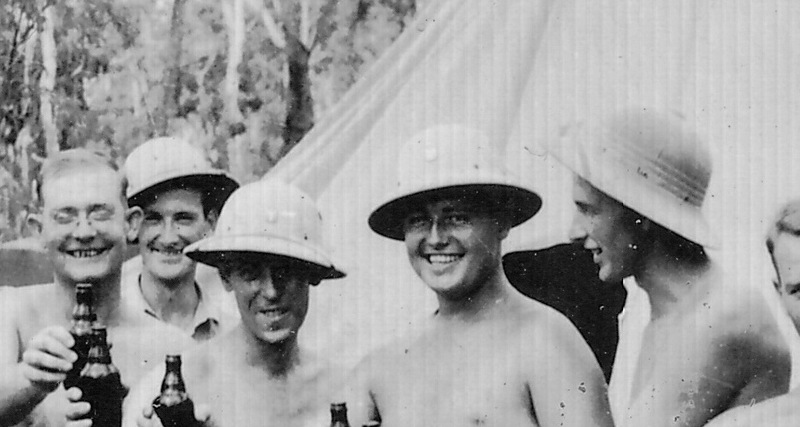 This situation of inheriting ww1 surplus equipment also extended to webbing, mess kits and steel helmets. Richard Cropp states that “the 147th was wearing the dowdy First World War model” [helmet] in his account. 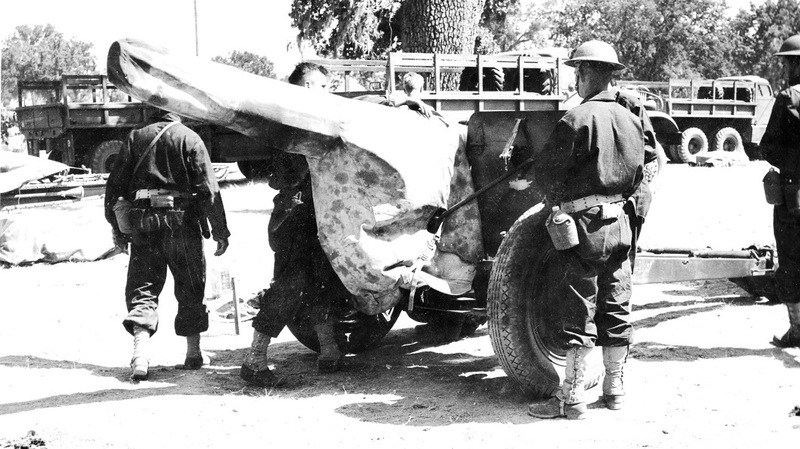 (R.Cropp, 1960, p.548) This is further evidenced by a photo taken (below) of a US 140th Field Artillery sergeant on maneuvers in the US in 1940-41. 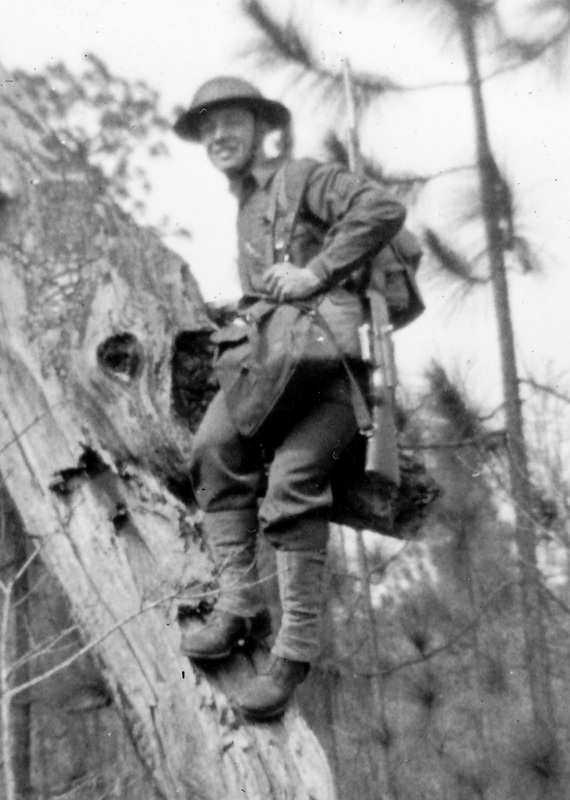 A sergeant of the 140th Field Artillery Battalion demonstrating the World War One era webbing which equipped much of the 147th. (Authors collection, 2013). 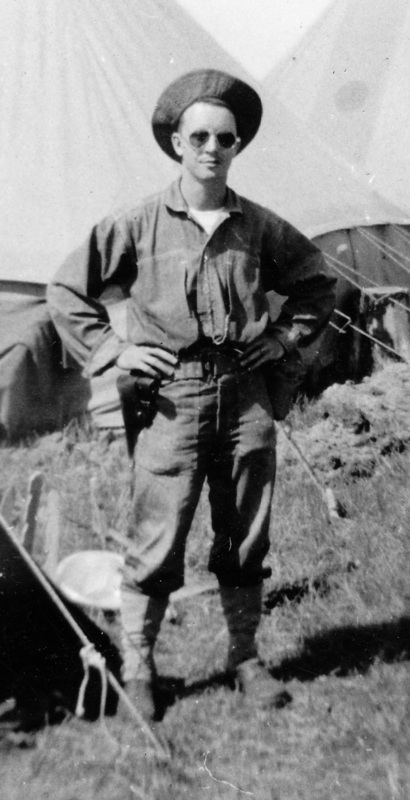 He is wearing a ww1 era haversack on his back, a cartridge belt around his waist, a ww1 medical pouch (left) and magazine pouch (right) for his colt .45. Regarding side arms used by the 147th Field Artillery, Richard Cropp states that “pistols formerly carried by all artillerymen had, in the case of all but officers and NCOs, been replaced by Springfield rifles” (R.Cropp, 1960, p.494). A soldier of the 140th Field Artillery demonstrating the uniform commonly referred to as “Chinos”. This consisted of a set of light weight tropical tan trousers and a shirt. This type of uniform was the standard for the 147th Battalion. (Authors collection, 2013). Illustrated here via a custom Dragon Models figure/accessories is a US 147th Field Artillery soldier, Northern Territory, in early 1942 based on the information researched thus far. 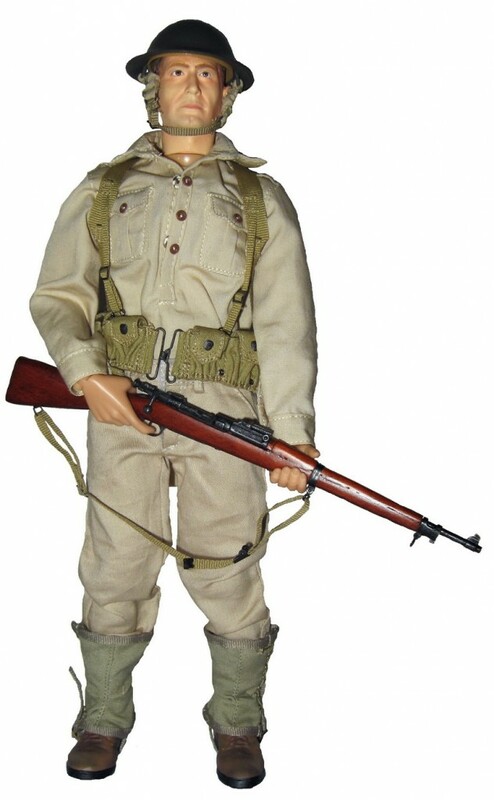 He is depicted with a ww1 era helmet, ‘chino’ uniform, 1903 Springfield rifle with sling. 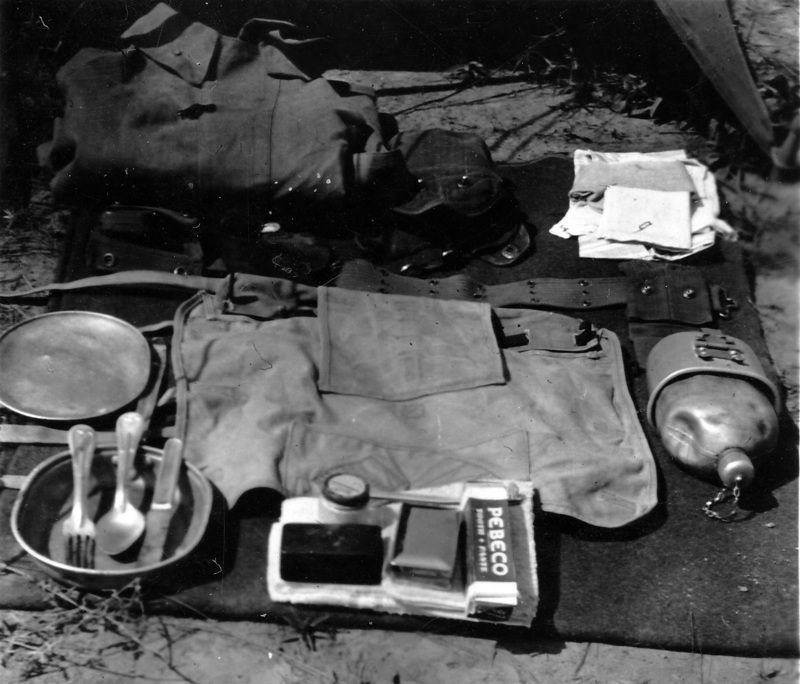 He has a ww1 era haversack with meat bag, bedroll, ww1 era bayonet to the left of the haversack and canteen. He wears a ww1 era belt with complete with .30-06 clip pouches and a ww1 medical pouch. His boots are the correct ww2 type with M1938 leggings. 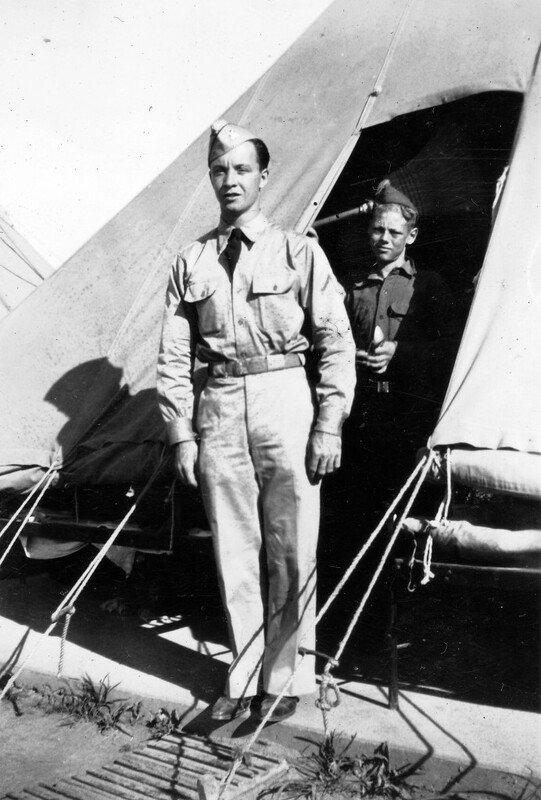 Above: An enlisted soldier from the 140th Field Artillery Battalion wearing his Class A uniform. 1941. (Authors collection, 2013). 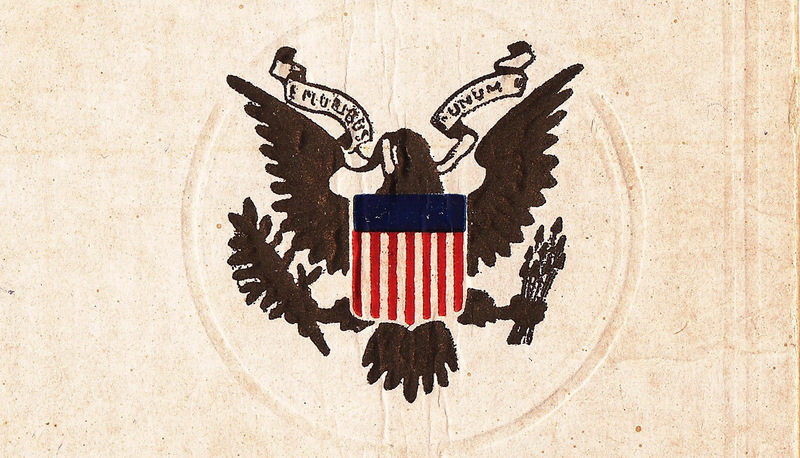 On his lapels can be seen the DUI (Distinctive Unit Insignia) of the 140th Artillery. The 147th wore the DUI pictured at left. 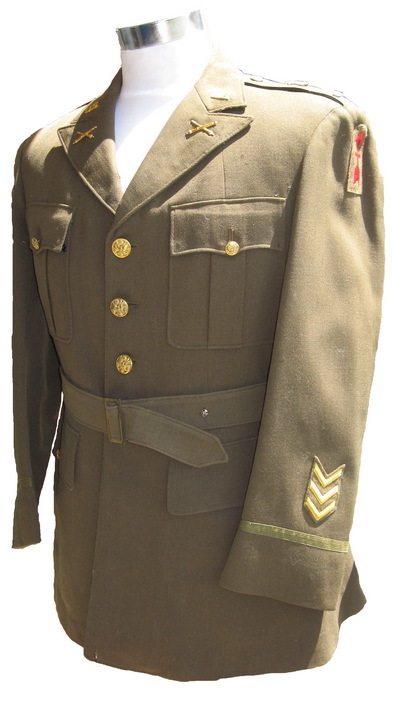 This is a 1st lieutenant’s Class A coat from the 121st Field Artillery Battalion (National Guard), 32nd Infantry Division which fought in New Guinea and serves to illustrate what officers of the 147th FA would have worn (Authors collection, 2013). On the right sleeve are three chevrons indicating the owner served for 1 year and six months during the First World War. The coat was manufactured in 1940. 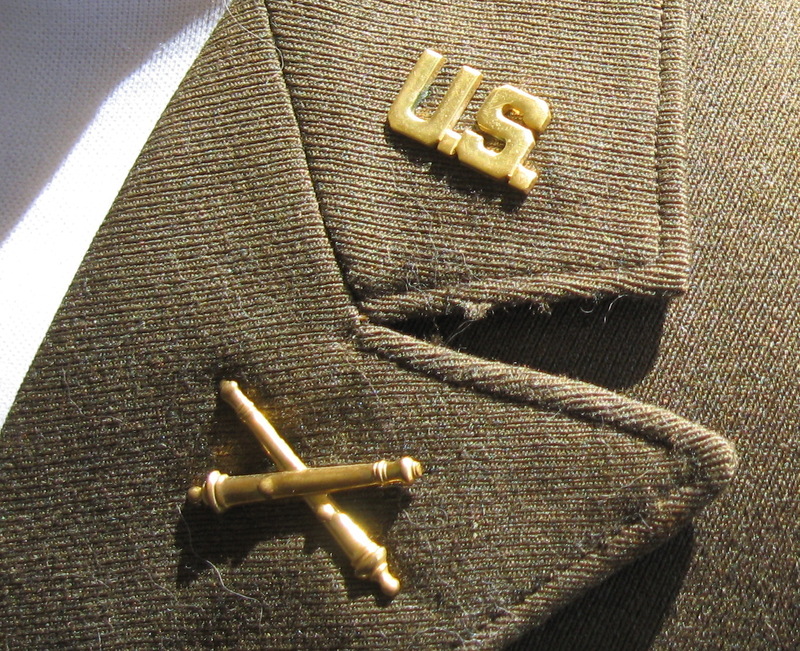 Cross cannons on the lapel indicate the officer belongs to the Field Artillery. (Authors collection, 2013). The other piece of clothing made use of by the 147th FA was the one piece denim coveralls pictured below (Authors collection, 2013). It is believed that those troops who had the task of operating and maintaining the 75mm M1897A4 made most use of this garment. The M1897A4 which was the main weapon as used by the battalion. 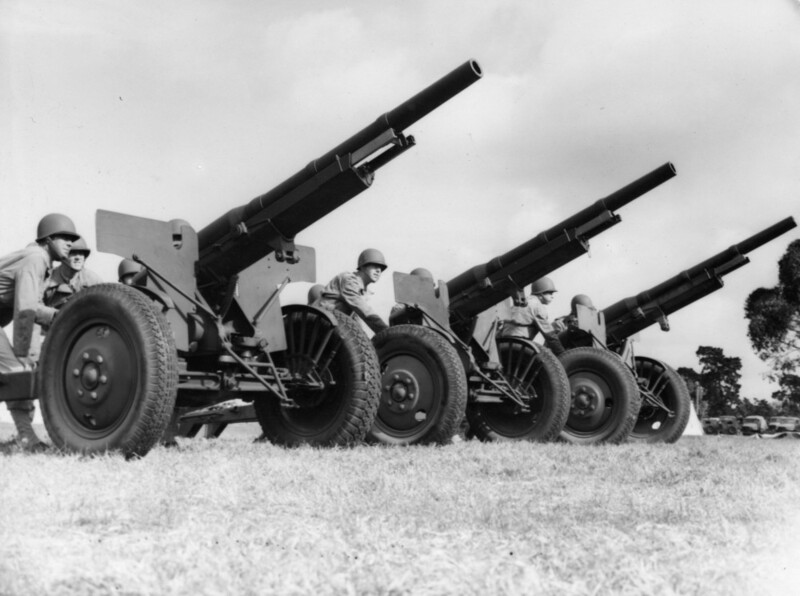 Artillerymen of the US 148th Field Artillery in 1941, stateside (Authors collection, 2013). This unit was the sister unit to the 147th Field Artillery and was in the Northern Territory at the same time in early 1942. 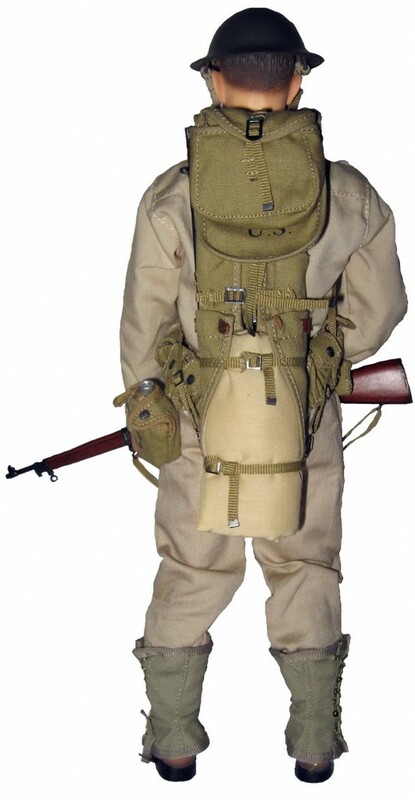 The photo clearly illustrates the denim coveralls, ww1 era webbing and ww1 “doughboy” helmets. In the center of the frame is a 75mm M1897M4 sporting a canvas barrel cover. 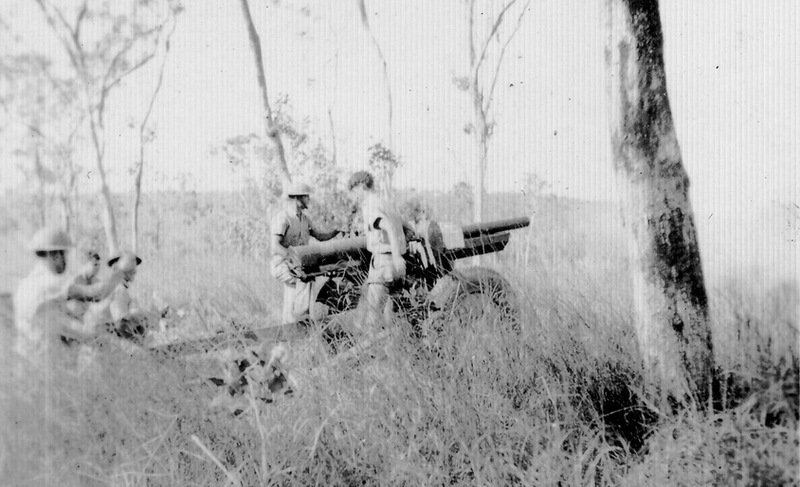 75mm, M1897A4 Field Guns somewhere in Australia during ww2. Argus Newspaper Collection of Photographs, State Library of Victoria. 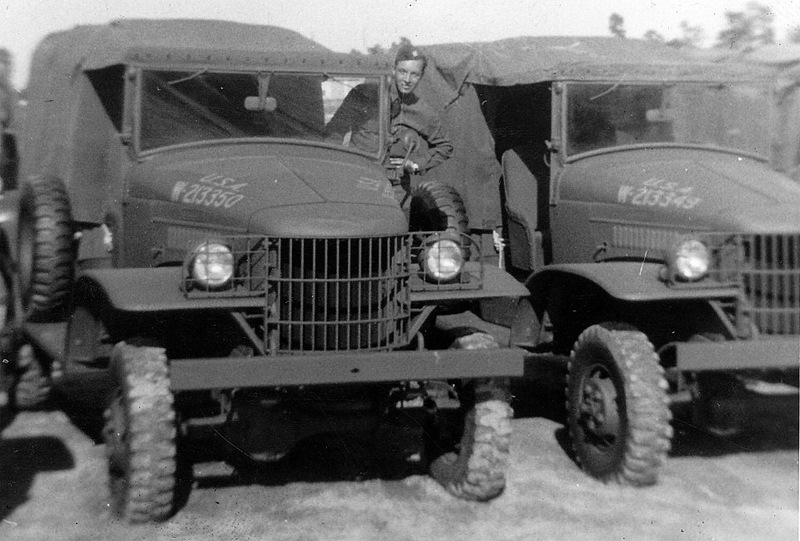 A pair of Dodge 1.5 ton 4×4 weapons carriers. The 147th and 148th FA used many of these utility vehicles in the Northern Territory for a range of different applications. Often they would serve as tractors to tow the Battalion’s M1897A4’s and 37mm M3 Anti-Tank Guns. (Authors collection, 2013). 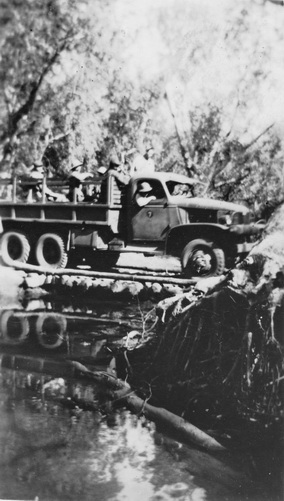 A GMC CCKW of the 147th or 148th Field Artillery crossing a stream on a makeshift bridge somewhere in the top end. Both US Battalions had a compliment of these vehicles, many of which had to be raised from Darwin Harbour following the bombing on the 19th of February, 1942. (Authors collection, 2015). 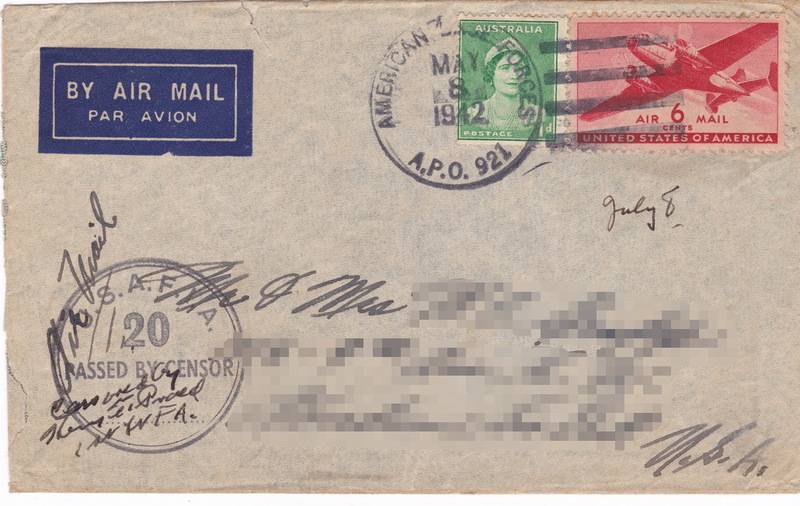 The cover of a letter sent by a member of the 147th Field Artillery in 1942 from US Base Section 1 as indicated by APO 921. The postal unit of the US Base Section 1 was located at Mt Bundy, Adelaide River.